The beautiful and ancient ensemble of the Moscow's Kremlin stands high on the hill towering over the left bank of Moskva-River. 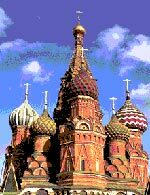 The Kremlin has always been perceived as a symbol of power and mighty of the Russian state, the national idea expressed in stone. Each era in the history of Russia left its significant architectural trace in the Kremlin. 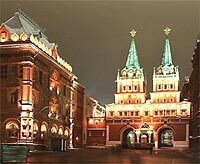 Late in the evening the brightly illuminated Kremlin ensemble presents a fantastic, majestic and sophisticated harmony. The story says that Moscow stands on seven hills. It was there, on Borovitsky Hill, where the first walls of the Kremlin were built long time ago. 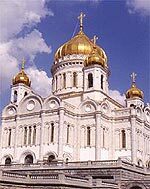 In the Middle Ages Moscow was a typical town-fortress. In the past thick Kremlin walls and high towers proved to be among the best engineering structures in the world. The walls of Kremlin were built by the order of Ivan the 3rd, the Grand Prince of Moscow and All Russia, in 1485-1495, to replace the white-stoned walls built by the order of Prince Dmitry Donskoy. The red-brick walls were erected by Italian masters Anton Fryazin, Mark Fryazin and Pietro Antonio Solario. The towers built by the Italian masters didn't have tent roofs, instead, they were crowned by the overhanging flat roofs with special loop-holes. The towers, which look like the Kremlin ones are found there in Italy, in Ravenna region, while the specific merlons of "Dove tail" shape are typical to the ancient Italian fortresses located in the vicinity of Vinchenza, Milan and Verona. The walls of Kremlin, which you may see on the old engraving were built by the order of Ivan the 3rd, the Grand Prince of Moscow and All Russia, in 1485-1495, to replace the white-stoned walls built by the order of Prince Dmitry Donskoy. The red-brick walls were erected by Italian masters Anton Fryazin, Mark Fryazin and Pietro Antonio Solario. The towers built by the Italian masters didn't have tent roofs, instead, they were crowned by the overhanging flat roofs with special loop-holes. The towers, which look like the Kremlin ones are found there in Italy, in Ravenna region, while the specific merlons of "Dove tail" shape are typical to the ancient Italian fortresses located in the vicinity of Vinchenza, Milan and Verona. In the 17th century the towers got their tent roofs to become the real architectural masterpieces. Totally, the Kremlin has 20 towers. The one, which stands close to Bolshoy Kamenny Most, is called Vodovzvodnaya (Water-Drawing) Tower. In the year of 1633 a special pumping mechanism was built inside the Tower to draw water from Moskva-River for the Court, which had always been there in the Kremlin, up to the reign of Peter the Great. The next one to the right is Blagoveshchenskaya (Annunciation) Tower. This Tower, as well as some other Towers of the Kremlin, received its name from the church located close to it. The next tower, which stands close to Blagoveshchenskaya, is Tainitskaya (Secret) Tower. A secret path from the fortress and a secret chamber were located there, that was why the Tower was called Secret. Then, there are Pervaya Bezymaynnaya (First Nameless) and Vtoraya Bezymyannaya (Second Nameless) Towers; and Petrovskaya (St. Peter's) Tower, which stands close to the Church of Metropolitan Peter and the angular Beklemishevskaya Tower. The last one got its name from the estate of landlords Beklemishevs, the estate was located right in front of the Kremlin wall, across the Moskva-River. From Beklemishevskaya Tower the Kremlin wall sharply turns to the north and climbs up the Vasilyevsky Hill to the Red Square. This section of the wall has three main Towers, as follows: Konstantino-Yeleninskaya (named after St. Constantine and St. Helen) Tower, Nabatnaya (Alarm-Bell) Tower and Tsarskaya (Tsar's) Tower. The legend says that Tsar Ivan the Terrible liked to stand on Nabatnaya Tower watching what was going on down there in the Red Square. The section of the wall, which faces the Red Square, starts from Spasskaya (Saviour) Tower. The Tower gates, the main gates of the Kremlin, have always been treated with special honour. The icon of the Saviour is placed on the Tower wall, that's why it received the name Spasskaya or Saviour in English. The Tower was built in 1491 by Italian architect Pietro Antonio Solari. In the past everybody passing through the gates of Spasskaya Tower had to take off their hats. That was the only Tower of the Kremlin which received such a privilege. The Tower clock with the bell-sound stroke for the first time in 1625. By the middle of the 19th century the old mechanism went wrong and was replaced by a new one. The musical shaft of the tower clock played the melody of "God save the Tsar...". After the October upraise the mechanism, damaged during the shelling of the Kremlin, was replaced for the third time to play "International". However, the revolutionary melody, somehow, affected the clock mechanism, which started to play a nice melody that had nothing in common with "International". At present the same melody is still played by the Tower clock. A new project is being currently developed, the experts will soon make the clock mechanism play the hymn of the Russian Federation. The weight of clock mechanism is about 250 tons. The diameter of each of four clock-faces equals to 6.12 m.